The Blackjack strategies if followed and implemented appropriately, it is guaranteed that its house edge will go down to the least. House edge is normally around half percent. One needs to tweak the fundamental strategy as per the rule variations which certain casinos could decide to use. As an example, a casino might allow for a DOS while some casinos might not allow so. Hence, it is suggested to make the changes to the fundamental strategy that depends on the needs for both multiple and single decked blackjack games. One of the easiest ways to get it done is by translating the main strategy chart to simple English which would explain how to play with 3 or larger no. of cards. For instance, if the first 2 cards of yours are a five & a three, the total is 8. Chart will then ask you to go for a hit. Another three gets drawn, the total becomes eleven and in that case chart will ask you for doubling at eleven. However, you could double only for the first 2 cards, so you have no choice but to hit. When translated in simple English, it becomes easier to comprehend. For instance, the earlier situation may be written as: In case you are having eleven, then double, hit otherwise. 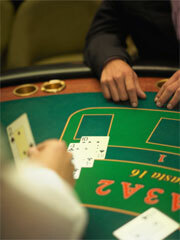 Blackjack card counting is also referred to strategies but it cannot be shown here and deserves the separate chapter. When the 2 initial cards don't have an Ace, it's called hard hand. Always hit, when you are having 8 or less. When you are having 9: When dealer has three through six, then double and otherwise hit. When you are having 10: When dealer has two through nine, then double and otherwise hit. When you are having 11: When dealer has two through ten, then double and hit if the dealer is having Ace. When you are having 12: If dealer is having two or three then hit, if dealer is having four through six then stand and otherwise hit. When you are having thirteen to sixteen: If dealer is having two through six, then stand and otherwise hit. When you are having seventeen to twenty one: Stand in all cases. When either of the initial cards has an Ace, it is called Soft hand. When you are having An Ace two or Ace three: When dealer is having five or six, then double and otherwise hit. When you are having An Ace four or Ace five: When dealer is having four through six, then double and otherwise hit. When you are having An Ace six: When dealer is having three through six, then double and otherwise hit. When you are having An Ace seven: When dealer is having two, seven or eight then stand, for three through six double and otherwise hit. When you are having Ace eight or Ace nine: Stand for all cases.